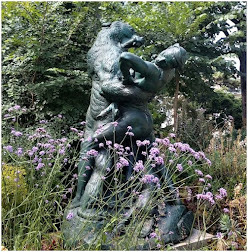 I've been itching to blog -- since that time way back in quilt camp weeks ago (or so it seems) -- but had a couple of major things to get out of the way first. Now that the moment is upon me, I don't know where to start. With the quilts? 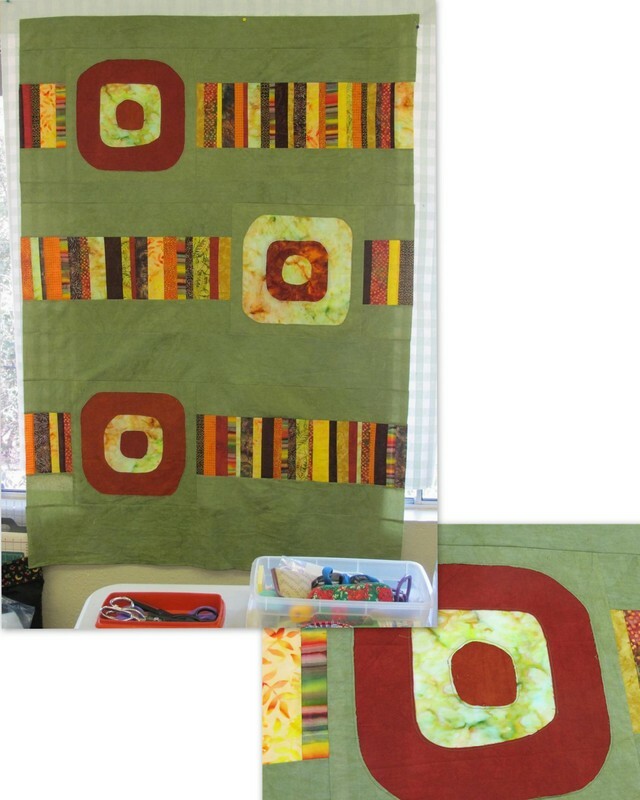 With other quilt camp stuff? With the room addition? With Thursdays Out? Or with the "things" that interfered? I have been known to promise "more quilts later" when faced with a similar dilemma, and ofter "later" hasn't happened. So I'll bring you quilts first, in the state they were when last I got a shot of them. 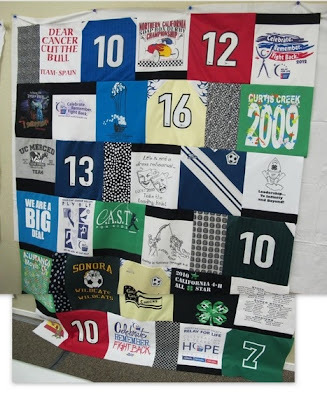 NOTE: Quilters: I would be pleased to put your name with the picture of your quilt if you would like to see it here. You've seen the the first four quilts in their earlier stages. 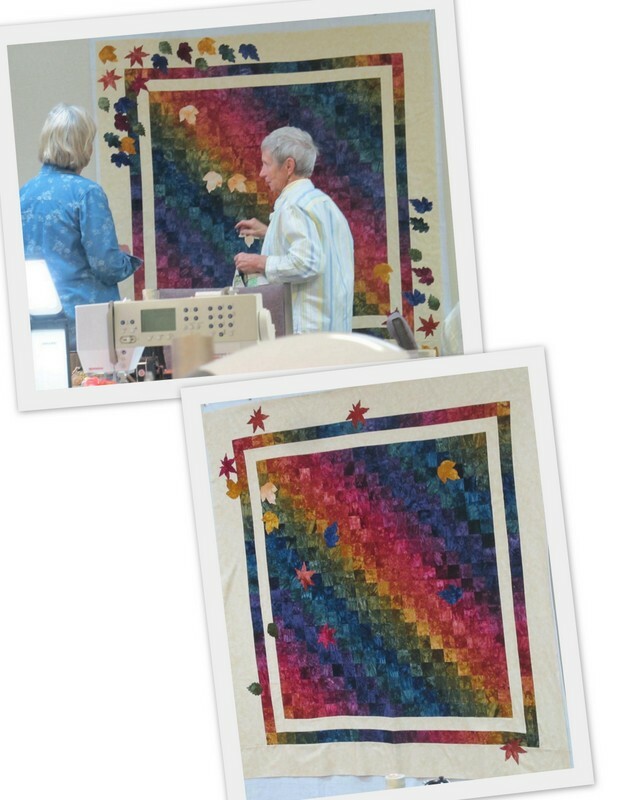 They were underway when these quilters first arrived and they went on to do borders and more blocks and thread art. This looks like a fun one to do. "We don't need no stinkin' ironing boards!" This next one has a story. Its "author" (on the left) was trying to develop a proper scattering of the autumn leaves. She would arrange them, would add more leaves, would take leaves off, would echo a pattern in a diagonal corner, set them in whoop-de-whoop leaf frames. She consulted with others. She'd have it perfect (in my humble but unvoiced opinion), then add more.She left her latest version and went to bed around 12:30 or 1:00, but it still wasn't really right. Then one Gremlin said to another Gremlin, "Let's fix it," and bounded to the design wall and began scattering leaves in a whole new pattern. I was a bit aghast. What if the author had thought it was perfect and went to bed to come back fresh in the morning to tack it down. Would she be furious? I was still asleep at the denouement the next morning, but the Gremlins reported that she said, "This is better than I remembered. 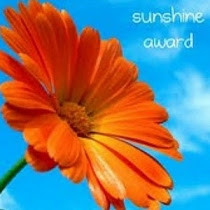 In fact, it looks pretty good." And she began immediately to iron on the leaves. I'm not sure whether this was the final final. As it turned out, she was making two identical autumn leaves quilts, for twins or something. The next two are partials, with blocks still under construction and not yet sewn together. I don't know whom they belong to. This is such an interesting pattern, and this quilter always shows up ready to do major productions. At this stage -- only partially sewn together -- it looks almost three dimensional. I'll love to see it completed. Two lovely small pieces. Those two central flowers were put on late in camp. I'd wondered and hoped that something would be between the two squared spirals. (I'm sure there's a fancier name than that.) They really completed the design. Muted colors in a star pattern . . . most unusual. Some things we'll see in the guild boutique at our fall quilt show? 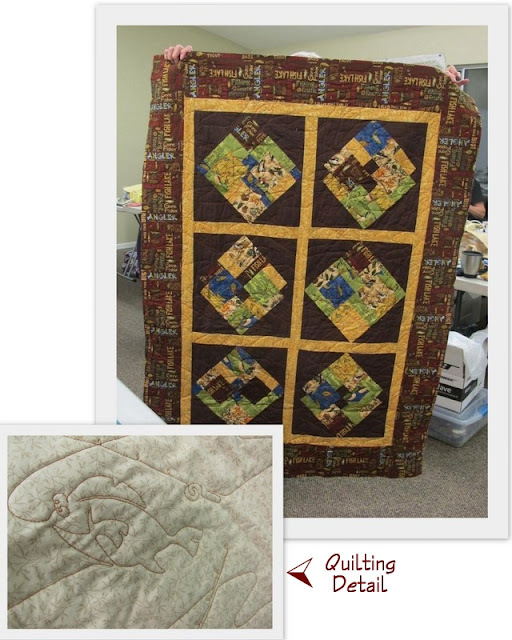 This fisherman's-themed quilt is quilted with fish! Traditional pattern in bright colors . . .
Small wallhanging with beautiful appliqued flowers in the corners. A color experiment. The patches will be attached to background, batting and backing with a soft edge applique in one step, then washed to give a slightly fuzzed edge to the pieces. Another thing to try! A star wallhanging or table runner hangs by these cute kitty blocks. You know I'm a sucker for cute kitties. I looked around the corner and saw this red, white and blue quilt for the first time. Amazing points on all these half-square triangles. I think she still has more borders to go! Ta-dah! I love the colors. Okay, one quilter stepping up. This is my hand applique project using my blue and white French fabrics. It's intended to take years to do in my NeedleCrafts group. I only did a little bit of it here at quilt camp so I won't shorten its work-duration too much. I'm not sure whether this tee-shirt quilt is causes or teams. It changed every time I looked across the room. 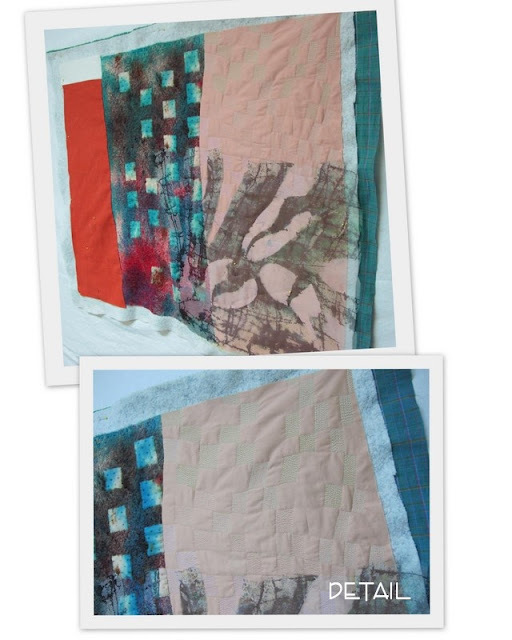 Maybe two quilts were actually made? Nifty plaid -- so traditional -- in a non-traditional design in this little wallhanging. 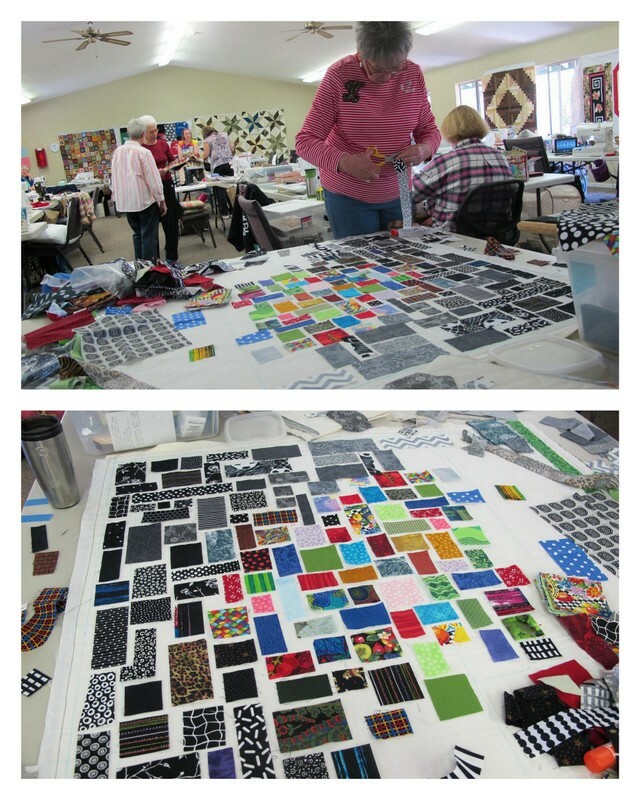 This is a "community quilt," being made for donation to groups that minister to those in need. Love the colors. This looks like a future Christmas quilt. The question raised about this wallhanging is whether it should be called Belt-and-Buckle or Watchband-and-Watch. What do YOU think? These are the works of two different artists with unique visions. Can't wait to see them completed. The final Ta-dah! Should be done in time for Halloween. a B&B in Groveland, CA, where this quilt will eventually hang. Don't you love the variety you've seen here? I need to relocate myself and three cats to Sister and Brother-in-Law's Garage Mahal in just a few days so the space I've been scrunched into during the room addition can itself be overhauled: new paint, new carpet, new vinyl and a bit of laminate. You can see where this will eventually go. I will need a new couch that cats can't shred. I'm glad I don't like granite counter tops so I don't need to bother with that. I do need to pack up anything I'd be really unhappy if it got broken. Otherwise, Craig and Tom will move my stuff. Do you think they can keep the refrigerator properly upright? Wherever they take it? Sooooo....see you when I can, writing on one of my miserable little laptops. If only quilting didn't involve sewing! LOL. I must say I have a love for all things autumn, so the ones with leaf themes impress me most. I especially like the scattering of leaves across the quilt - nice. Glad you had a good time. There's always a ton of things to do when one returns from being away, but with your renovation, I suppose that is multiplied by about a hundred. Thanks for dropping by. You're sure right about its being hectic at home now. I seesaw between being very blasé-go-with-the-flow and thinking I'm about to freak out. My fall-back position is that I can pay the guys to do it if I can't do it myself. My best bet may be to tape instructions on everything, take my kitties, and leave. Bring your big computer over. We can set up the desk you gave us in Garage Mahal (note sister could stay in the guest bedroom, but she wants to sleep with her kitties, and six unfamiliar cats in our house proper wouldn't work. Does wifi extend to Garage Mahal? I'm not sure I want to haul all this stuff over. I'll pretend like I'm on a trip for a couple of weeks and have to do everything by laptop. Good practice for summer. Maybe I'll learn how to email a blog in. Each of my two laptops has big (and different) pitfalls, so maybe working them in tandem (something I can't do on a trip) will work. Dear Readers, staying in Garage Mahal is nothing like staying in a grease-pit. It's intended as a home for fine British Motor Cars and, as such, has standards. I'm glad you voted for the quilt show-and-tell. I need to find myself a cross stitch camp. Hi Julie, Googling cross stitch retreats 2013 brings up a few hits. Since quilts seem popular here, I should really try to go back to those old promises to show more from earlier quilt shows. 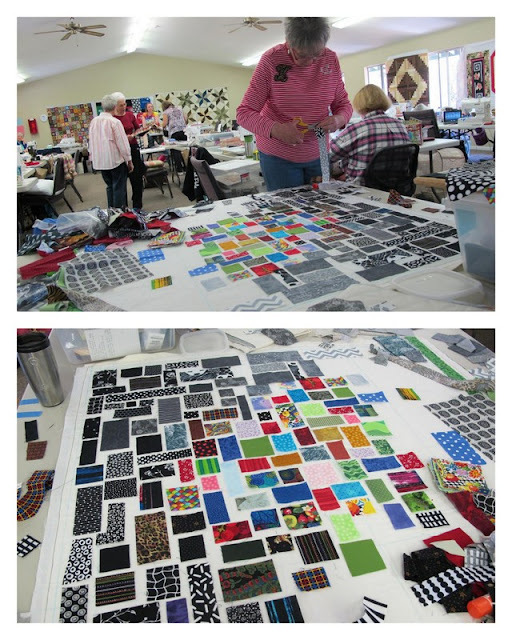 I had no idea your quilt camp was so populous--nor that it had so many wonderful quilters! Those are some fabulous projects and it's making my fingers itch. As far as the renovation goes, take what you can, and the kitties, leave notes--your guys have proven themselves trustworthy, unlike the wrecking crew I had hired! We need to put our heads together--I'm having to do everything on the laptop, or the iPad, since my big computer died. It's not much fun but at least it's doable! I think QC's capacity is something like 42 or 44. It's a matter of having adequate workspace for each quilter and still be able to move around the room. We do run a little short on wall space. I still love a big computer. My favorite laptop used to be my IBM ThinkPad, which made me perfectly happy. I'd buy another in a minute but it's too heavy for me to put in the overhead compartment. At least on my tiny HP notebook I discovered I can turn the stupid touchpad off and use the mouse, but my bigger Sony doesn't seem to have that capability and I hate text leaping around on the page. I've been hoping Surface Pro 8 would solve my problem, but I'm not buying without trying. I have discovered that Blogger works more smoothly in Chrome than in IE (Google likes Google), but it's mystifying for some other things so I jump back to IE. Oh, THAT'S what it is . . . When it suddenly dawns on me . . .
Close your eyes and breathe . . . .